On 27 March 1918, David Lloyd George, the British Prime Minister, presented to his cabinet plans to raise a further 555,000 men for the war effort of which 150,000 were expected to come from Ireland. On 9 April 1918 in his speech in the House of Commons Mr Lloyd George introduced the Westminster’s Government’s new Man Power Bill. The provisions included conscription for Ireland. The text of the Military Service Bill also provided that any man who at the passing of the Act has not attained the age of 51 could be deemed enlisted for general service. A sub-section substituted 56 for 51 years in the case of medical practitioners. Mr John Dillon, leader of the Irish Parliamentary Party, stated that Irish conscription would destroy all hope of a settlement of the Irish Home Rule question during the war. 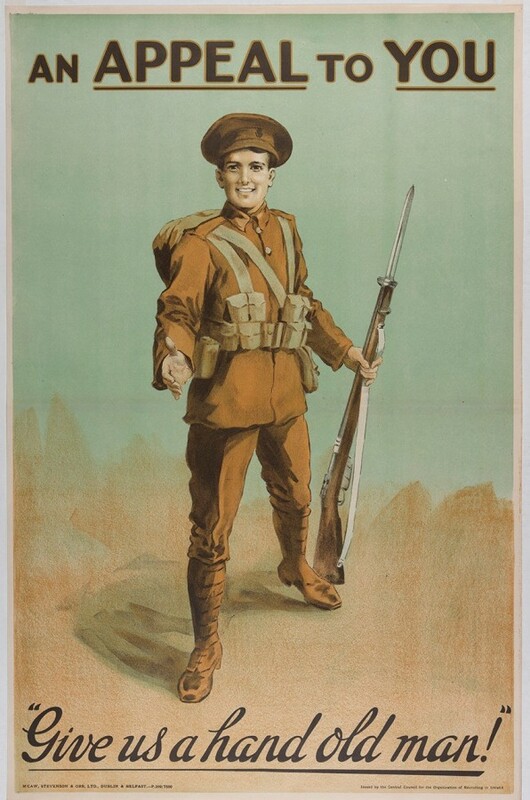 To apply conscription to this country could, Mr Dillon, declared, “open up another war-front in Ireland, and this spirit of discontent would spread to America and Australia and wherever the Irish race was scattered. For the remainder of the war they (the Government) would have to hold Ireland under strict military law”. In the same week, the report of the Irish Convention concluded but the British parliament’s decision to link Irish conscription to a Home Rule bill was a move that alienated Irish Nationalists and Unionists alike and created a backlash. The Irish Volunteers declared they would resist conscription. Sinn Féin and the Irish Party formed committees to direct opposition. Mass Public meetings were held across the country. On 15 April 1918, an enormous public meeting assembled at a platform under the shadow of the National Monument on the Grand Parade, Cork. The entire thoroughfare was utterly impassable from the Monument as far as Tuckey Street and all along the Grand Parade. Most noticeably, a very large contingent came from the North-West Ward headed by the priests of the parish and bearing with them a large banner inscribed: Cork’s resolve – Death before conscription. They were accompanied by the Butter Exchange Band. Other bands that took part being the Transport Workers Band, the Workman’s Fife and Drum Band, and the Piper’s Band. Addressing the crowd, the Lord Mayor, Thomas C Butterfield, said on behalf of the committee who called the meeting that he wished the crowd present to make a solemn promise “to resist in every way that, was in its power this iniquitous net of the British Government in attempting to enforce compulsory military service on the Irish nation against the will of the Irish people”. He outlined that there would be resolutions submitted for their approval. Bishop Cohalan was received with cheering and said he had great pleasure in proposing the resolution: “That we, the citizens of Cork, assembled in mass meeting, solemnly protest against the proposal of the British Government to impose conscription on the Irish nation in defiance of the will of the Irish people”. Continuing he highlighted the mass opposition; “No measure of the British Government had excited Ireland so much for a long time as the conscription measure. Why had that measure disturbed Ireland? Was it that young Irishmen were afraid to shoulder the gun and face the enemy? The young men of Ireland who had already joined the army had proved that, they were able to face an opposing force with bravery. The young men of Ireland had also proved that at home”. He pitched that the young men of Ireland did not see that the war was Ireland’s war, and they protested against being asked to join the British Army against their will; “A British Parliament never tried to force a measure on either England, Scotland or Wales against, the wills of the peoples of those countries; but when it came to Ireland that government proposed to force a measure on their people which made the greatest demand on the nation—to force a measure on the nation without the consent or approval of the nation”. The Bishop was pleased to see such a large turnout in their city noting the action of Lloyd George’s Cabinet had welded together all parties of different political views in Cork and in Ireland from the North to the South – that the whole of Ireland was united in one movement of opposition to the Military Service Act. Mr J J Walsh, of Sinn Féin, in seconding the Bishop’s resolution, said if it became necessary to fight they were prepared for that. The advice he gave to the crowd was not to do anything impulsively until they had heard from their leaders. He declared that he did not want bloodshed, but if it had to be faced, then they must be ready. They did not want war, but if the British Government forced war upon the Irish people they would not shy away from it. Conscription, he believed, would be passed and “the manhood of Ireland must be prepared and ready”. He advised householders to lay in a supply of food. The people should stand firm in this crisis; “The Government may parade their machine guns against us and may tell us they would be shot down if we did not drill for service. If they took our gruelling like-men and stood unshakable, the Government would shrink from wholesale bloodshed in face of the feeling of universal detestation”.